Emory Creek Campground will be opening for the season on Friday, May 10. Fee collection for overnight camping will begin on May 10. 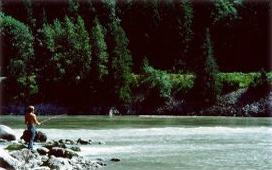 Emory Creek is located 18km north of Hope on Hwy #1. The Fraser River is susceptible to extreme water levels and velocities during spring/summer run-off seasons. This park is cooperatively managed by a community, society or other partner. Services and facilities may differ from those offered in other BC Parks. This park is located next to the Canadian Pacific Railway mainline. It is illegal to operate an uninsured/unlicenced motor vehicle in any provincial park, recreation area or campground. Reservations are not accepted at this park, all campsites are on a first-come, first-served basis. For parks information on the reservation service, click here. 18 km north of Hope on Hwy #1. The closest communities, towns and cities are Hope and Yale. There are no digital maps or brochures for this park. History: Emory Creek in 1858 was a tent and shack camp, established by miners in search of gold. When it became evident that the gold was not available in the amounts estimated, the miners started moving north on the Fraser River. A few Chinese remained in the area. The area came into the hands of a man named Walker, who felt Emory Creek would become the head of riverboat navigation on the Fraser. Eventually, he sold the land to the Oppenheimer Brothers in early 1879. In the fall of 1879, Emory was chosen by the C.P.R. as the western terminus. In a short time it became Emory Creek. The town consisted of thirteen streets with its own newspaper, various shops, a brewery, nine saloons and a sawmill. When Yale was made the terminus, Emory was all but abandoned by 1885, with the completion of the railway. Today, it is an easily accessible treed campground with paved roads and flush outhouses. Campfires are permitted in the fire rings provided. There may be fire restrictions in place during times when forest fire hazard is high. While campfires are allowed and campfire rings are provided at each campsite, we encourage visitors to conserve wood and protect the environment by minimizing the use of fire and using campstoves instead. Firewood can be purchased in the park or you may bring your own wood. Fees for firewood are set locally and may vary from park to park. Limited burning hours or campfire bans may be implemented. To preserve vegetation and ground cover, please don’t gather firewood from the area around your campsite or elsewhere in the park (this is a ticketable offence under the Park Act). Dead wood is an important habitat element for many plants and animals and it adds organic matter to the soil. This park offers vehicle accessible campsites on a first-come, first-served basis - campsite reservations are not accepted. There are 35 sites, 2 of which are double sites. There are no pull-through sites. Sites are all in the trees, shaded, and equipped with tent pads. There is no parking available for extra vehicles. There is no gate house. If there are no staff to help you locate a site, find a campsite with no ticket number on the post. Park staff will come by to collect camping fees. Camping is not permitted if the gate is locked. The closest store is across Hwy #1 from the park entrance. BC Senior’s Rate (day after Labour Day to June 14 only): $10.50 per senior party/night. Read the User Fees Policy for information on Senior Camping Discounts.